Deadly car bombings and artillery fire shatter the ceasefire in Syria several hours after it begins. The ceasefire in Syria shattered on Friday, just several hours after it began, AFP reported. 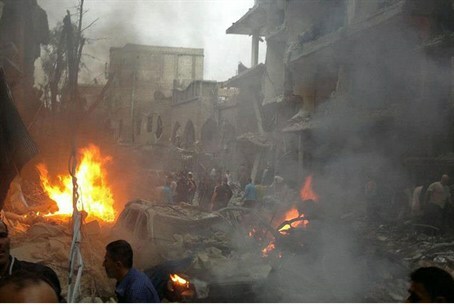 Deadly car bombings and artillery fire shattered the already fragile truce between the warring parties in the country. State television blamed "terrorists," the regime term for rebels, for a car bomb attack in Damascus that killed at least five people and wounded dozens, and a rights watchdog reported another deadly bombing farther south in Daraa. Rebels accused regime forces of opening up with artillery in the embattled north, where the Syrian Observatory for Human Rights said fighting erupted near the key army base of Wadi Deif. The army said it was responding to attacks by armed rebels that violated the truce agreed to mark Eid al-Adha, one of the most sacred holidays in Islam, which started at dawn. UN and Arab League envoy Lakhdar Brahimi had brokered the ceasefire in the hope that if successful, it could lead to a longer cessation of violence. President Bashar al-Assad's forces and main rebel group the Free Syrian Army (FSA) had both agreed to a call by Brahimi to lay down their arms for the four-day Eid, but both also reserved the right to respond to attacks. "Armed terrorist groups attacked military positions, thereby clearly violating the halt to military operations agreed by the army command," the military said in a statement read on state television and quoted by AFP. "Our valiant armed forces are responding to these violations and pursuing these groups," it added. An FSA commander in the northern city of Aleppo accused the regime of breaking the pledge to stop firing. "The regime does not respect the ceasefire, it is not shooting and there are no clashes but it has started shelling... What ceasefire? We can't trust the regime," said Abd al-Jaber al-Akaidi. "The regime is perfidious, a cheater and a liar," he added. The Britain-based Observatory reported car bombings in Damascus and in Daraa, cradle of the anti-regime revolt that has become a fully fledged uprising since it first erupted in mid-March last year. The watchdog said the a car bomb blew up outside the Omar bin Khattab mosque of the Daf Shawk district in southern Damascus, killing five people and wounding more than 30, adding that children were among the casualties. State television reported at least five people killed and 32 wounded in the "terrorist" act. A security source told AFP the bombing had targeted residential buildings for police officers and their families, and that children were playing in the area when the blast occurred. In Daraa, three soldiers were killed and eight wounded when a car bomb exploded near a military checkpoint and the railway station, the Observatory said. Eight troops were wounded, most of them critically. Earlier Friday, Iranian leader Ayatollah Ali Khamenei blamed the United States and Israel for the ongoing violence in Syria. Khamenei accused the U.S. and Israel of inciting violence between religious groups in Syria in order to weaken the Islamic world. Western governments “are still pouring fuel on the fire,” Khamenei added. The Western world wants conflict in Syria in order to divert attention from its internal problems, he accused. Khamenei reiterated Iran’s support for Syria. Israeli-Arab MKs voiced similar views Thursday. MKs with the Balad party held a news conference during which they claimed that the violence in Syria is part of a conspiracy against Assad and blamed the U.S. for bloodshed in the country.